application form for this Mahapariksha Zilla Parishad Laboratory Technician jobs last date is 16-04-2019. 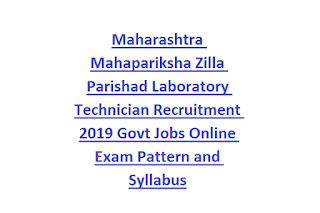 Maharashtra Laboratory Technician jobs of ZP online application form will be accepted through www.mahaparksha.gov.in website. Mahapariksha Zilla Parishad Laboratory Technician jobs selection is on basis of online exam. Laboratory Technician exam will be held for 200 marks with 100 objective type questions. 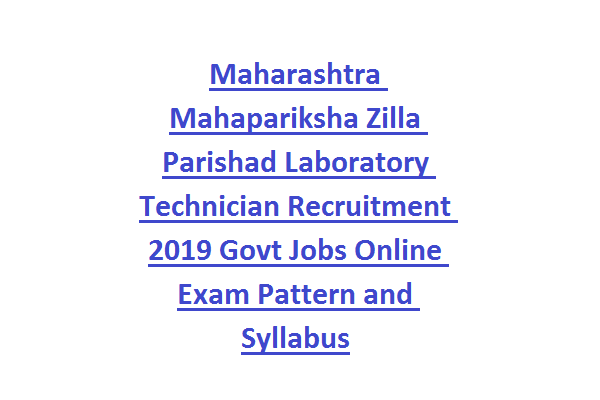 Laboratory Technician jobs Exam Syllabus, Exam Pattern, Laboratory Technician selection process, age limits and more details of Mahapariksha Zilla Parishad Recruitment Exam 2019 notification is updated below. There are many Laboratory Technician vacancies in all the districts health departments under Zilla Parishad. Check District wise vacancies here..
B.Sc Chemistry/Physics/Biology/Zoology/Medical lab Technology qualified candidats are eligible to apply online for this LT vacancies. Age limits for reserved candidates is 18-43 years and for open category candidates age limits are 18-38 years. An objective type online exam is conducted for LT posts for 200 marks. For Laboratory Technician posts written exam is online mode and consists of 100 objective type questions. Apply Online at www.mahapariksha.gov.in for this Mahapariksha Laboratory Technician jobs on or before 16-04-2019. Exam Syllabus PDF, admit Card release date, LT exam result and other information is updated below. 10 days before the ZP LT exam date admit card/hall ticket will be released in Mahapariksha official website.